Hover your cursor over the image to see a larger list of available paint colors. 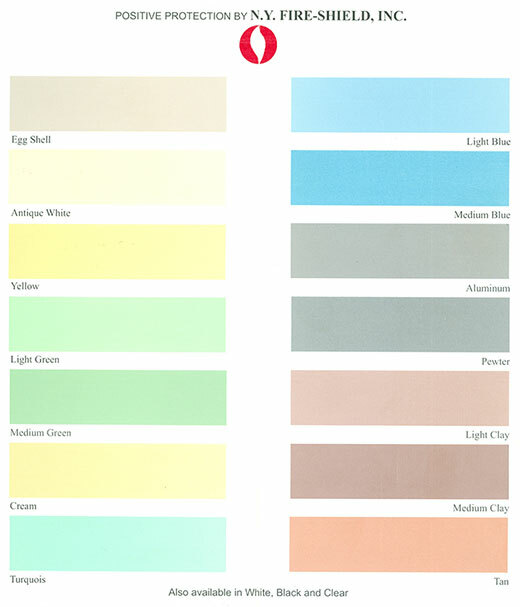 You can also download a pdf version of our paint color list. PLEASE NOTE: Our 1500° Paints & Varnishes only come in pastel shades of white, as you can only add 2 oz. of tint per gallon to any fire retardant paint before it loses its fire retardant characteristics. Click the links below for detailed information on our Paints and Varnishes! 1500° Series FRL is a Class "A" (FS10) rated, interior latex, fire retardant paint. Packaging: 1 gallon, 5 gallon, and 55 gallon containers. 1500° Series FRV-WB is a Retardant Polyurethane Varnish Class "B" (FS55) is a water base, one-component, two-coat application. Packaging: 1 gallon, 5 gallon, and 55 gallon containers. 1500° Series FRV is a Class "A" (FS15) intumescent fire retardant varnish for interior use. Packaging: 1 gallon, 5 gallon, and 55 gallon containers. 1500° Series FRT is a Class "A" (FS15) intumescent fire retardant varnish overcoat for interior use. Packaging: 1 gallon, 5 gallon, and 55 gallon containers. 1500° Series FRV-GF is a Class "B" clear, transparent flame retardant finish for interior use on gym floors and other wooden surfaces. Packaging: 1 gallon, 5 gallon, and 55 gallon containers. 1500° Series Foam Barrier is a Class "A" (FS20) rated, interior latex intumescent fire retardant/ignition barrier coating for polyurethane foam insulation. Packaging: 1 gallon, 5 gallon, and 55 gallon containers. SYNTEC 6550 is a water-based, water and oil repellent finishing agent. Packaging: 5 gallon drum, 55 gallon drum. Dealer and quantity discounts are available. Call us at 1-800-513-5134 to order or use our contact form!